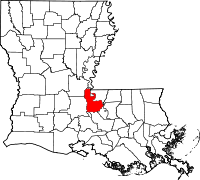 Pointe Coupee Parish, founded in 1807 and one of the original parishes in Louisiana, has a strategic location in the corner of the state, bordering the Mississippi. It has two major highways and over thirty minor ones running through it. It's considered part of the overall Baton Rouge Metropolitan Statistical Area, however the parish population remains relatively small at 22,000. The Pointe Coupee Parish Court Recorder with the Clerk of Courts is the parish contact for information on its vital records. Birth records, marriage records, and others, are available at the Recorder office, which is located in the town of New Roads, the parish seat, at 201 East Main Street. To inquire by phone, call (225) 638-9596. In addition to the Mississippi River, four other rivers flow through the parish, all tributaries of the Mississippi, and part of the Atchafalaya National Wildlife Refuge is located there, as well.